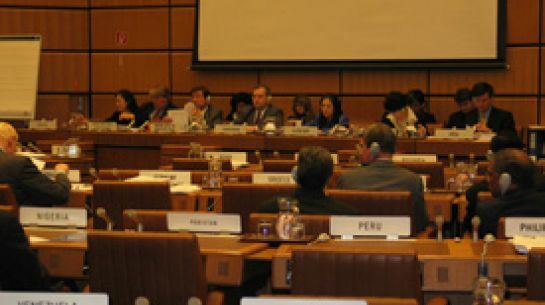 I’m just back from Vienna, where I was speaking at the United Nations Committee on the Peaceful Uses of Outer Space (COPUOS) in my capacity as Co-Chair of ITACCUS, the Committee on the Cultural Utilisation of Space, a new committee of the International Astronautical Federation. COPUOS is an interesting body. It was set up in 1959 to facilitate international cooperation in the peaceful uses of outer space, which include communication, remote sensing and global positioning satellites and astronomy. It oversees the implementation of a number of treaties and agreements, including the Outer Space Treaty, which governs the exploration and use of outer space, including the moon and other celestial bodies. COPUOS has 67 member nations and is one of the largest committees in the United Nations. I gave apresentation about how the arts and culture can contribute to, and help to promote, the peaceful uses of outer space and the work of COPUOS, and showed some images by artists we’ve worked with, includingAleksandra Mir, N55 and Neal White, London Fieldworks, Morag Wightman, Flow Motion and Simon Faithfull. I think it was a new perspective for the committee members (from all over the world), who seemed to appreciate it.